Market is buzzing with the latest launch of this NFO of Mirae Asset MF. Know all about the same! 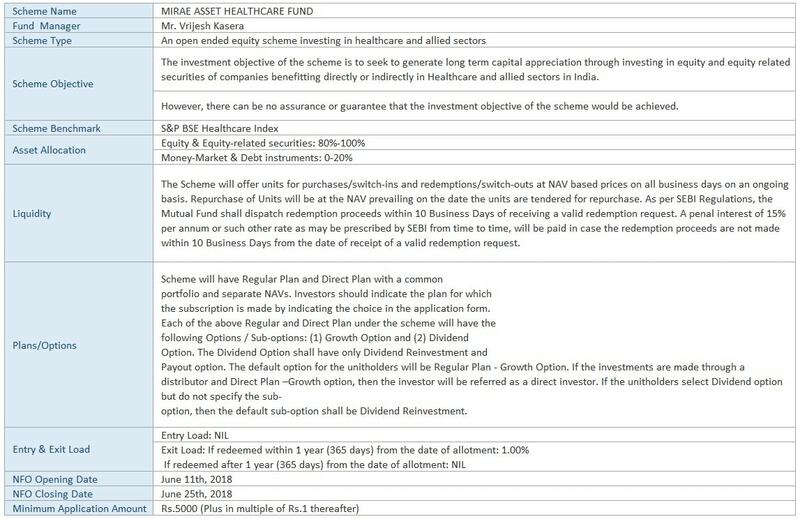 Mirae Asset Mutual Fund has just opened subscriptions for its recently launched NFO, Mirae Asset Healthcare Fund. It is an open-ended equity scheme which will invest in healthcare and allied sectors. It initiated its subscription from June 11, 2018, and the same will close on June 25. Mr. Vrijesh Kasera will be managing the scheme. Let’s find out what are the reasons to invest in this new fund offer. Why Invest in Healthcare Sector? Being a land full of opportunities for players in the healthcare sector, India has been popular globally due to this segment. The competitive advantage lies in its large pool of well-trained medical professionals and cost-competitiveness as compared to its peers in Asia and Western countries. Market Size: The Indian Healthcare Information Technology (IT) market is valued at US$ 1 billion currently (April 2016) and by 2020 is expected to grow 1.5 times. Investing Opportunity: Several mutual fund experts believe that share valuations of the pharma sector are cheap as of now; thus their protracted underperformance over the past three years is leaving room for significant potential upside. At least 80% investments will be made in pharma, healthcare, and allied sectors. The fund will adopt a fundamental, bottom-up approach that aims to identify growth companies with high return ratios (ROE) and sustainable competitive advantage. It will have the flexibility to invest across market capitalization and style in selecting investment opportunities within this theme. It will endeavor to maintain a concentrated portfolio of 30 – 40 stocks. The positive sentiment in the pharma sector can be well identified from the revenue growth that is witnessed in the industry. To this, several analysts have estimated that the growth of this segment’s companies can jump to provide twice the growth on a year-on-year basis after low single digit growth during the period of transition toward GST. It is further stated that in the next two to three years, the companies falling under healthcare segment are expected to deliver superior earnings growth, i.e., at a min of 15 percent for the next 2 to 3 years. Going with the view of experts at MySIPonline, use the SIP route to invest in this segment with a three-year time frame through this NFO. To invest in Mirae Asset Healthcare Fund, visit https://goo.gl/iNXfzG right now. For more details on Mirae Asset Healthcare Fund or other schemes of the AMC, visit MySIPonline. We will keep you updated with the similar information and their performances.